I am so excited to show you this amazing outfit! The Knit Tank and sweatpants were made for the Pacific Crisis Fundraiser and they’re too cute for words! Not only am I sucker for shamrocks, but, it’s all for a good cause! 100% of the proceeds from the purchase of the knit tank will be donated to Americares charity and 50% of the proceeds from the sweatpants will be donated as well! The hair shown is Shammy and it’s the current group gift from Ploom! Mouth clover included! Today, I bring you….BERRIES INC! A store that is just painful it’s so cute. The shirts..the skirts..the ginormous bunnehs.. Such good stuff. The HOODIE! It’s so pretty and very…new england. I dunno why, but, it is so go with it. It comes in 5 color options AND my favorite is that it comes with a separate AO that allows you to look cute in your hoodie and your current AO. Just keeps the middle area from going all wonky. Isn’t that sad? You buy something adorable but your AO totally kills it? NOT a problem here! Hair: ([e]) – Garden City Relief! So many goodies, so little time. Last night I went and snatched up this uber warm parka from Toxic Kitty. New..ish…maybe? Anyway, comes in a variety of colors and is perfect. The Sweater and Leggings are ~exclusives~ found at the For The Love of…Ice Festival! Ohp! I can’t forget to talk about the boots! 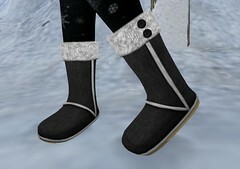 These super cute and cozy winter boots are a ‘Good Buy’ at *BOOM* right now. 20 colors. 90L each! I am such a huge fan of BOOM. I’m deeply in love with Aranel’s Wings. They are SO CUTE and just perfect. Wings are always nice. Well, the idea of them are nice. But, they tend to be REALLY gaudy and lag the bajeebus out of everyone. NOT a problem with these. They’re small, go with anything/everything and will never cause anyone lag. Also, there’s one set for every occasion!